A great sorrow has befallen our church in Fulham, S.W., by the sudden death of Lieutenant W.A.D. Stone, the son and only child of Mr. and Mrs. C. Stone, the senior society steward and his wife. “Will,” as he was affectionately called was brought up in Fulham and in our school and Band of Hope. He was educated at Peterborough Road School, and in the Chelsea Polytechnic, and matriculated in 1915. 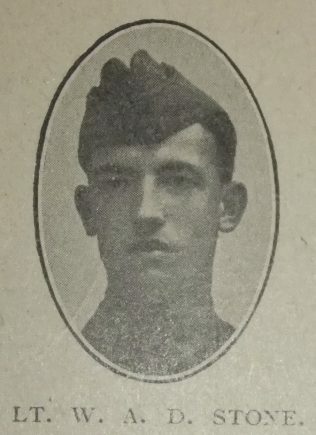 He entered the service of a firm in Battersea as an analytical chemist, and followed that occupation until March, 1917, when he joined the Royal Air Force. He underwent a course of instruction with the O.T.C. ay Denham, and with the rank of First Lieutenant, afterwards transferred to the East Surrey Regiment. In October, 1918, he was drafted overseas, but was only in active service for a short time before he got pneumonia. He was placed in hospital in France for a few weeks, and then transferred to the Prince of Wales’ Hospital, Marylebone. At the time of his death he was twenty-one years of age, and was anticipating his discharge from the service. On Monday, November 24th, he left home to go cycling, saying he would be back to dinner. Nothing more was heard of him until his parents were informed that “Will” was cycling in the neighbourhood of Kingston Bridge when his machine skidded and threw him under a motor lorry. He was in the choir, and sang the solo in the Sunday evening service on the night before his death. He was a good son, courteous and popular. The funeral service in our church and at the cemetery was conducted by Rev. W. Jones Price.